The 10 Best Craft Stores in Wisconsin! Whether you’re running an Etsy shop or it’s simply one of the passions in your life, a key to successful crafting is the right supplies. Wisconsin is home to a variety of local craft stores offering everything from custom framing to homemade jewelry to crocheting supplies. Here are the 10 best in the state! Ben Franklin Crafts is Southeast Wisconsin’s favorite craft destination, whether it be for art supplies, floral décor, yarn, etc. They’ve been in business since the early 1970s, and are an independently owned and operated craft store. Besides having the best selection of crafts, they also offer services such as custom framing, mat and glass cutting, bridal consulting, and they accept charitable donations to places such as the Oconomowoc Food Pantry and the Waukesha Women’s Center. The store also offers various crafting classes and clubs that you can join! Anthology was started by two sisters, their mission to facilitate creativity by selling works by local and independent artists, selling goods that spark said creativity, providing a space for people to create and supplies for them to take home and create with, and donating money to local non-profits. They sell things such as prints, t-shirts, handmade ornaments, tea towels, as well as a variety of protest buttons and digital downloads. Joann Fabric and Craft Store has various locations throughout the U.S. but the Cudahy store in Wisconsin is a particular favorite of Wisconsinites. Here customers will find outstanding customer service and fabric and other craft supplies that seem to go on for days. You’ll also find the biggest selection of yarn that comes in an abundance of colors and textures. 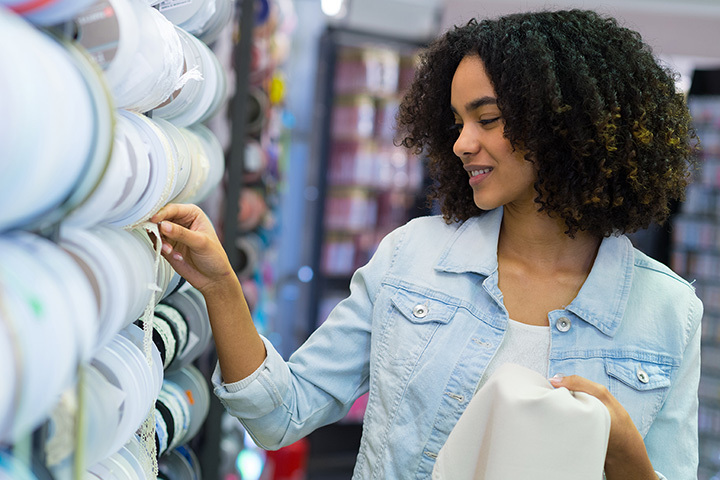 Joann Fabrics also offers a variety of crafting classes, including the ever popular ‘Foodcrafting’ in which you learn to decorate cakes and watercolor paint cookies! The Craft Barn in Galesville is quite literally a craft store in a barn. The barn was a working dairy barn until a tornado tore it apart in 1998 and was converted into a gift store in 2002. The interior remains intact with its bright red cow stations and white washed beams. It is truly a unique, one of a kind store that you most likely won’t find anywhere else! Be sure to check out the wall of cookie cutters and patio furniture! Herrschners was founded by young Frederick Herrschner in the mid-1800s, and has been one of the best places in Stevens Point, Wisconsin for quality craft products for over 100 years. Whether its quality yarn, knitting and crocheting supplies, needlework or other craft and hobby supplies you’re after, Herrschners has it all. Be sure to check out their ‘Inspiration and How-To’ page for fun, creative craft ideas! Beads, beads and more beads! It’s like you’ve died and gone to bead store heaven. Eclectica is THE bead store in the Midwest and they feature THOUSANDS of beads in all sizes, textures, and designs including, but not limited to: seed beads, freshwater pearls, and semiprecious stones. Next door to Eclectica is The Bead Studio, which offers classes to help you create beautiful and stylish jewelry to your liking. Winneconne Crafts is a family owned and operated business, specializing in products such as Sizzix, Cricut, Cuttlebug, Spellbinders, Taylored Expressions, and other embossing and die-cutting projects. It’s a great family friendly craft store with quality products, excellent prices, and an amazing staff always willing to assist and share their knowledge. Located in downtown Beaver Dam, Wisconsin, Kornley’s Craft and Hobby Center has over 14,000 square-feet of craft supplies to choose from and recently celebrated 45 years in business. The store features two floors of yarn, fabric, beads, knitting, crocheting supplies, etc. and is easy to get lost in, especially if you’re just in the mood to browse! Let the supplies speak to you as you search for that perfect piece. What are you in the mood to create? Stamps? Scrapbooks? Maybe a little paper crafting? The staff at Let’s Create as experienced crafters and know their products. More importantly: they love what they do and they love sharing their knowledge with others and encouraging them to find that creative spark. Be sure to sign up for one of their many crafting classes, where you’ll make new friends, learn new techniques, and share your experiences with others. Another truly unique, one of a kind craft store in Wisconsin! At Susan’s Fiber Shop, visitors can see fibers being made from the very beginning— starting with the sheep (no sheep are harmed in the making of the fiber). From spinning to weaving, to fleece and more, Susan’s Fiber Shop has all your fiber needs, no matter your project!